Apple is known for its supply chain mastery and rigid price discipline. Now, with the iPhone 5 release date just weeks away, Apple and its third-party retail partners are offering iPhone 4S discounts — rare moment in time, perhaps the first since 2007, when there are too many iPhones. So many, in fact, that Apple feels the need to cut prices, amazing. No press release has been issued, but third-party resellers are marking down the iPhone 4S and iPhone 4. Further, Apple is price matching in its retail stores. See a good deal at Target or Best Buy? The brick n’ mortar Apple Store will match it up to $49.01. 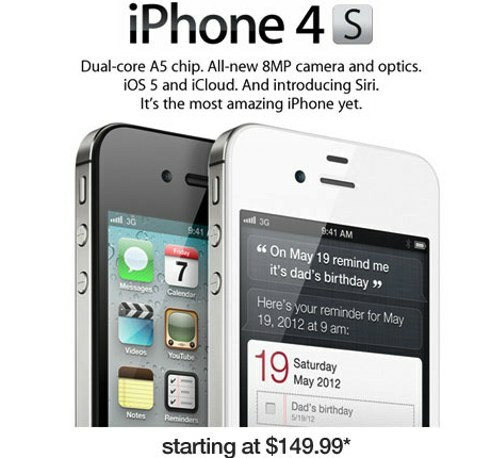 That said, as you can see in the above image, Target is offering the 8GB iPhone 4S at a $49.01 discount ($149.99). Assuming your monthly bill with AT&T or Verizon is $90 a month, that is like getting about 5/9 of a month for free. Similarly, Best Buy has marked down the 8GB iPhone 4 by $49.01 (image below) to $49.99, which is again like getting 5/9 of a month for free. Then there is RadioShack — no, we won’t call you “the shack” — which is also offering the iPhone 4S at $49.01 off. For its part, number three US carrier Sprint is offering iPhone 4S discounts of up to $86, though Apple isn’t matching the full amount. Again, Apple Stores will match up to $49.01. And, all of this is a mere prelude, a house cleaning ahead of the iPhone 5, which is expected to be introduced on September 12 and then ship on September 21. Ready to buy a “bargain” iPhone 4 or iPhone 4S today, or will you be waiting for the iPhone 5 with bigger screen, faster processor and better everything?